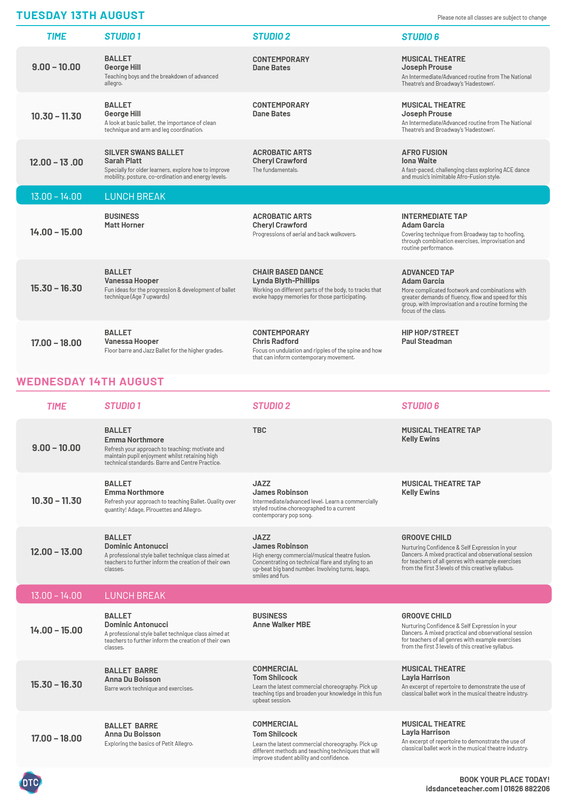 Build your own timetable from our extensive programme of classes with dance industry professionals. Choose day passes or individual sessions to suit you. Please note all classes are subject to change. Teaching boys and the breakdown of advanced allegro. An Intermediate / Advanced routine from The National Theatre’s and Broadway’s ‘Hadestown’. A look at basic ballet, the importance of clean technique and arm and leg coordination. Specially designed for older learners, this will explore how to improve mobility, posture, co-ordination and energy levels for more mature students. A fast-paced and challenging class exploring ACE dance and music’s inimitable Afro-Fusion style. Progressions of aerial and back walkovers. Covering technique from Broadway tap to hoofing, through combination exercises, improvisation and routine performance. Fun ideas for the progression & development of ballet technique (Age 7 upwards). Chair based exercises/dances, working on different parts of the body, to tracks that hopefully evoke happy memories for those participating in the classes. More complicated footwork and combinations with greater demands of fluency, flow and speed for this group, with improvisation and a routine forming the focus of the class. Floor barre and Jazz Ballet for the higher grades. Focus on undulation and ripples of the spine and how that can inform contemporary movement. Refresh your approach to teaching; motivate and maintain pupil enjoyment whilst retaining high technical standards. Barre and Centre Practice. Refresh your approach to teaching Ballet. Quality over quantity! Adage, Pirouettes and Allegro. An intermediate to advanced level experience, to learn a commercially styled routine choreographed to a current contemporary pop song. A professional style ballet technique class aimed at teachers to further inform the creation of their own classes. The class will be a high energy commercial/ musical theatre fusion. Concentrating on technical flare and styling to an up-beat big band number. Involving turns, leaps, smiles and fun. Nurturing Confidence & Self Expression in your Dancers. A mixed practical and observational session for dance teachers of all genres with example exercises from the first three levels of this beautifully creative set syllabus. Barre work technique and exercises. Learn the latest commercial choreography. Pick up teaching tips and broaden your knowledge in this fun upbeat session. An excerpt of repertoire to demonstrate the use of classical ballet work in the musical theatre industry. Exploring the basics of Petit Allegro. Learn the latest commercial choreography. Pick up different methods and teaching techniques that will improve your students’ ability and confidence.